While working on an iOS project, I encountered the realization that a massive storyboard was a bad idea. It is simple and very easy to implement everything in one storyboard, but a large storyboard has many drawbacks such as being slow to load, it is difficult to get a complete picture of what is going on, and if you work with others it can be difficult to deal with version control. In this tutorial, I will discuss how I separated out the main storyboard into multiple ones and how to get it to work specifically with a TabBarController. At the end, I will discuss why I approached it the way I did and why I felt it was a good way to do it, feel free to correct me or suggest other ways as I am still learning Swift and iOS development! Smaller storyboards that are thus easier to understand. Easier to collaborate with version control. 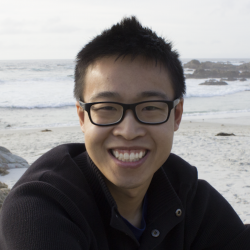 I am still learning Swift and iOS development, I do not consider myself an expert and would actually still consider myself a beginner, but I want to share what I've learned and worked out so far to help others! Create a new single page application for iOS. Make sure to be using Swift as the language. You can leave Core Data unchecked as we do not need it. 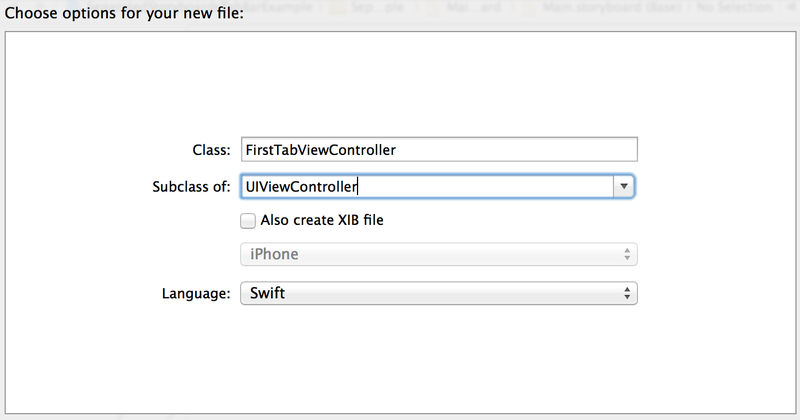 Remove the default ViewController.swift file and "Remove Reference" when asked. In the Main.storyboard you can select the view controller that's present and delete it. We'll set up a new TabBarController instead. Drag the Tab View Controller from the Utilities bar into the Main.storyboard. Click on the Tab View Controller and in the Attributes inspector, check the "Is Initial View Controller". XCode will thus know what to load when the application loads. 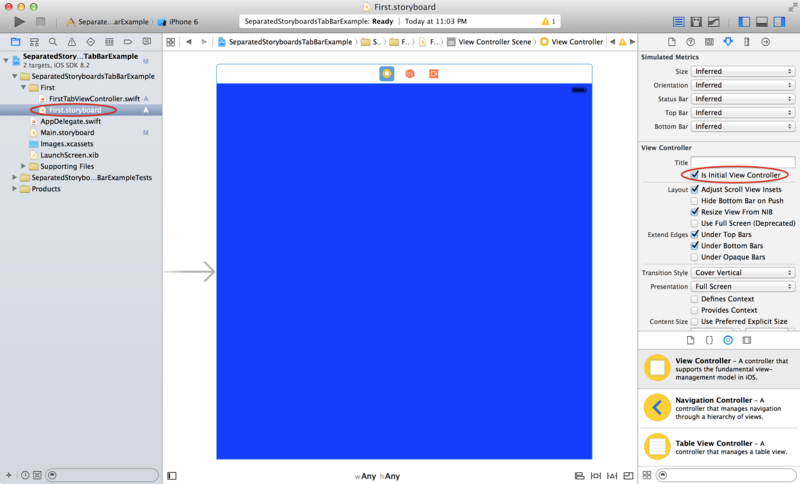 The first step is to drag a View Controller from the Utilities bar into the Main.storyboard. 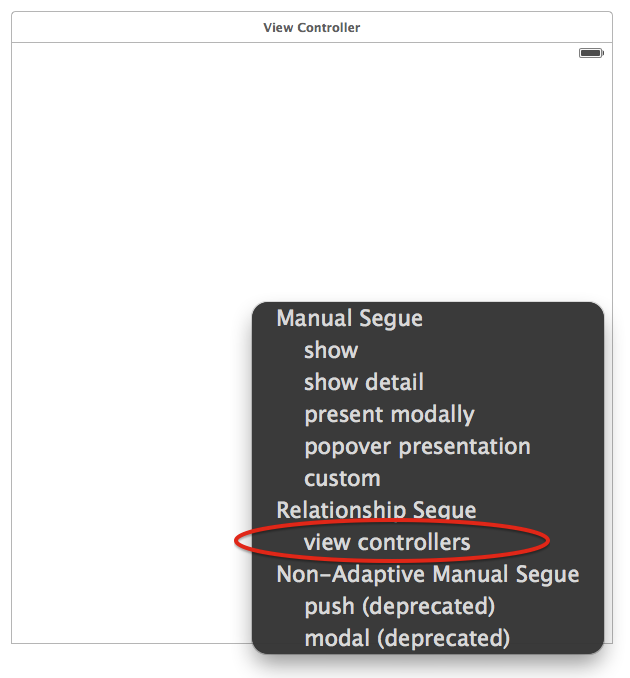 Control drag from the Tab Bar Controller to the View Controller and under "Relationship Segue" select "view controllers". This sets up the view controller so that it works with the TabBarController. You can then modify it as you see fit for the tab icon and names. We're now going to start creating the separated section for the tab. We'll create a New Group in our project called First. This will be to just be modular and keep all our files associated with the "First" section such as the storyboard and the view controller to help set up using this separate storyboard. Then create a new file and choose iOS > Source > Cocoa Touch Class and we'll name it FirstTabViewController and make sure it subclasses UIViewController and is a Swift file. This will now be the file we use to connect the two storyboards together! 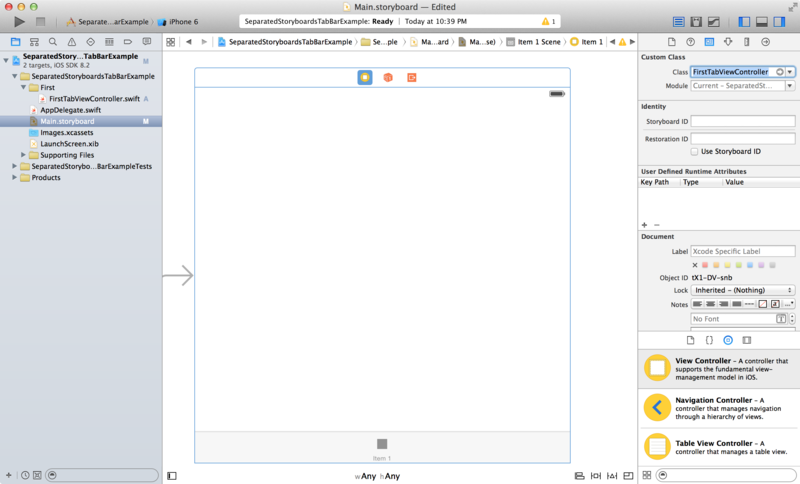 in Main.storyboard select the first view controller for the first tab and in the Identity tab set the class to FirstTabViewController. Now we can set up the new storyboard for our "First" section or tab. Create a new file and choose iOS > User Interface > Storyboard and save as First which will save as First.storyboard. This will now be the storyboard that we add all our views for the "First" section or tab. 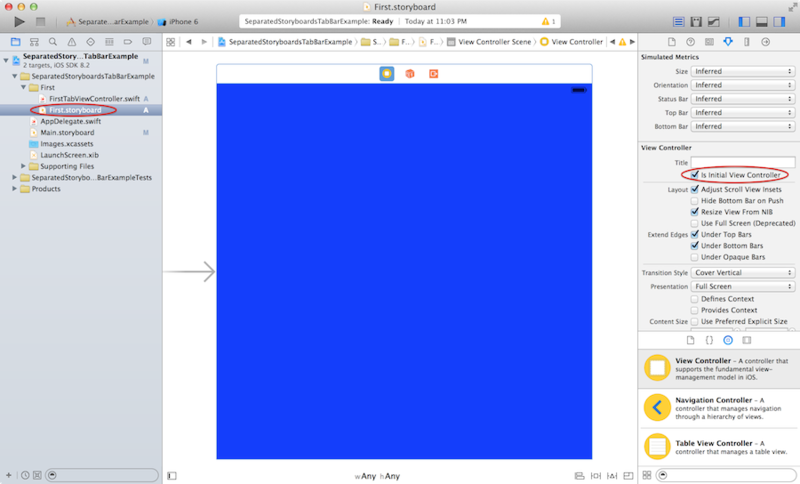 In this example, I will add a simple view controller and set the background to blue. Make sure to set your entrance point to "Is Initial View Controller". If you forget to do this, then you will get an error on initializing the storyboard. These are the 5 lines of code that you'll use when wanting to use a separate storyboard and load it into your tab. Note: In newer versions of XCode 8.3+ you will be required to have as! instead of just as for the casting. The project I push to Github (at end) is for XCode 8.2 which uses the older as version without the exclamation. From here you now know how to add a new separate storyboard for each tab. 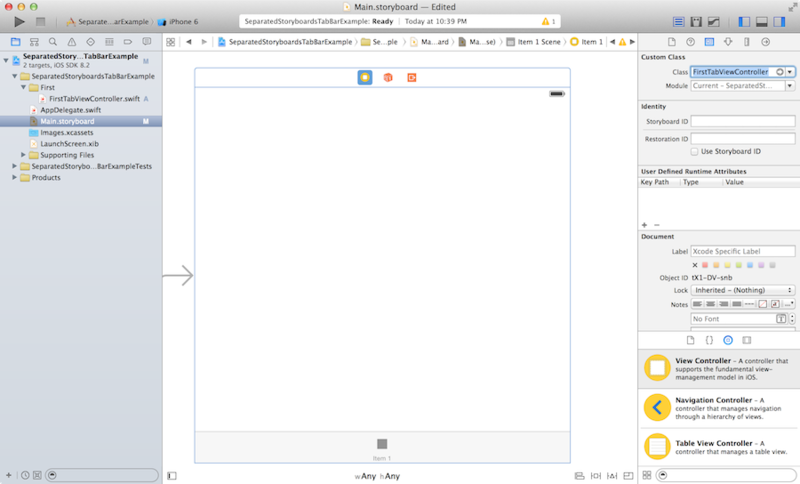 All you have to do is add a new Storyboard and View Controller which I generally call TabViewController prefaced with some name to describe the section. 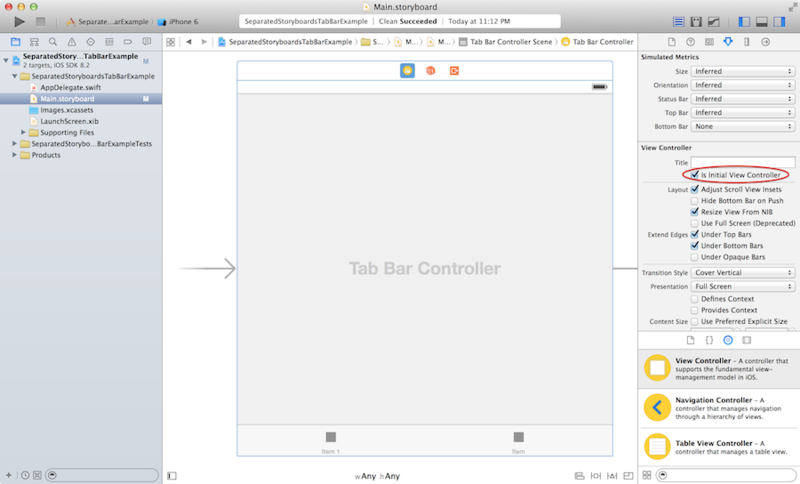 This TabViewController will help link your main storyboard to the separate storyboard! I've gone ahead and repeated this for the second controller as well and set that background to green. Note: You can actually create your own parent class of TabViewController to house all the logic of loading the storyboard and adding the new storyboard as a child of the TabBarController and thus simplify the coding! I did not do this in the example to allow you to see the code in action. I'm not sure if it is necessary to discuss what happened in this tutorial but I thought I'd bring a bit of my thoughts into the post. In the beginning, a partner and I were working on a project which had 5 tabs and we had all the UI in the Main.storyboard. This file took a bit to load and whenever we both modified some UI elements, we had to worry about merges which are not easy. Thus I set out to actually figure out how to separate out the storyboards so that we could have a more modular project. My first instinct was to just try to programmatically add the Tab Bar Controller, but then I thought this would be too much work because we already had things started. I still think it's nice to have the storyboard with the TabBarController because it allows us to add segues or at least get a visual feel of the application we are designing rather than having it all in code. 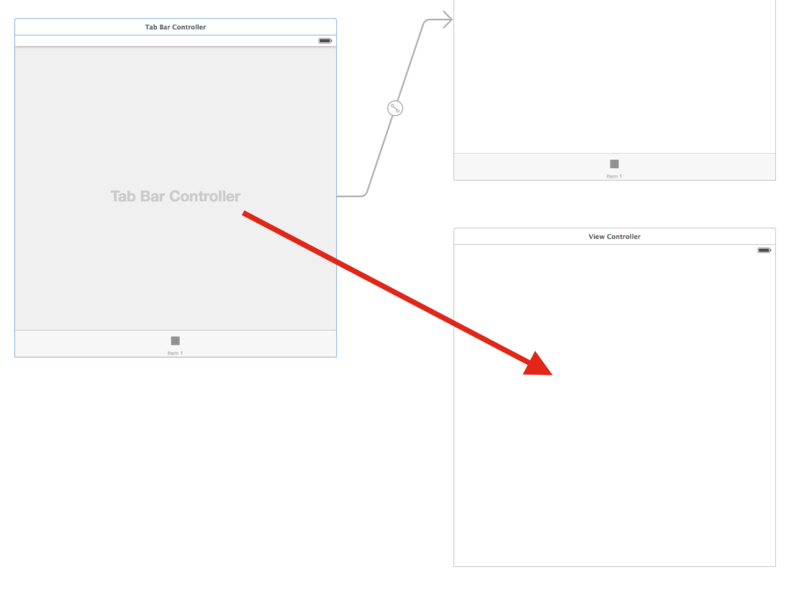 It seemed only logically that I needed to attach a view controller in Main.storyboard in order to get the proper tab nesting with the TabBarController. If I did not have this, I could easily program for example buttons or programmed segues to load the storyboards instead; however, I think that this tutorial universally helps understand using separate storyboards due to the extra steps needed to work with the TabBarController. I do still wonder if this is the correct way to do it, so let me know if there is a better way or if you have a different way and want to discuss the differences or pros/cons! Thanks and hope you enjoyed this tutorial!